This photograph of the boat yard in Bonassola, Italy captures the colorful boats that sail and fish the coastline in Italy. 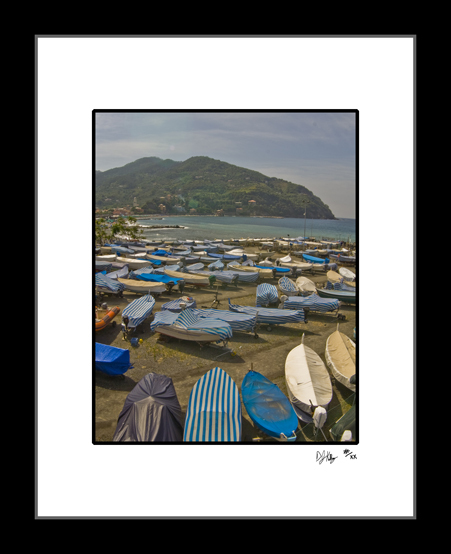 These boats display colorful blue and white covers that are traditional in the area around Cinque Terre. Bonassola is two towns north of Cinque Terre, a quick train ride away, but well away from the tour guides. Instead this is a beach town that can be walked around in a short time. This picture was taken from the walking path that stretches the entire length of Bonassola, Italy.